Nicholas Russo demonstrates one of the origami antennas to FIU President Mark B. Rosenberg. As a child, Nicholas Russo always loved science. In elementary school, his show-and-tell projects consisted of demonstrating electronics kits. It wasn’t until high school, when he made it to a state science fair, that he realized he could actually make a living in science. 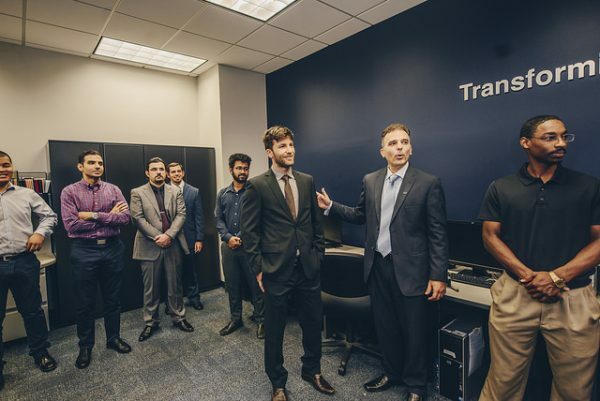 Thanks to an FIU Presidential Fellowship (PF), Russo, who is 22 years old, is working towards his doctoral degree in electrical engineering with a focus on electromagnetics. 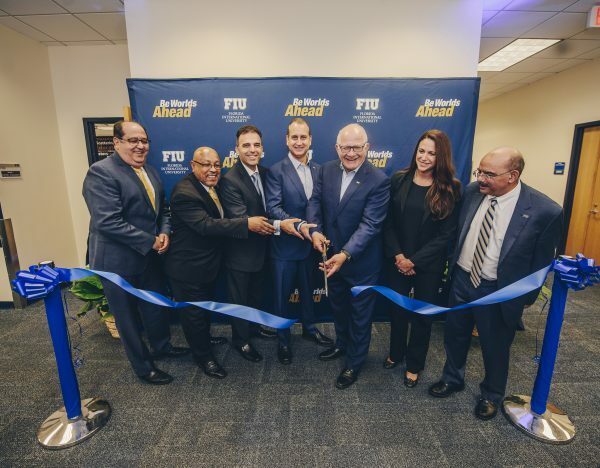 Russo is part of the FIU College of Engineering & Computing’s Transforming Antennas Center (TAC), which researches and creates origami antennas and wearable technology. Also known as smart clothing, these garments have military use – soldiers can carry or wear flexible garment-based antennas, lights, batteries and other electronics that can all be wirelessly powered. Tractica, a market intelligence firm that focuses on human interaction with technology, forecasts that smart clothing will grow 72 percent by 2021. Additionally, it estimates that smart military clothing will be a $500 million market this year. The Air Force recognized the multidisciplinary aspect of the origami antennas and also saw an opportunity to produce human capital, train students and post docs, and expand professors’ knowledge in this field. Dr. Stavros Georgakopoulos introduces Dr. Constantine Zekios at the ribbon-cutting ceremony. It is that compelling research that attracted postdoctoral fellow Constantine Zekios to FIU. Zekios, a native of Pyrgos, Greece, obtained both his undergraduate and graduate degrees from Democritus University of Thrace. In pursuit of better job opportunities, he came to the United States and worked as a post-doc at the University of Massachusetts at Amherst for three years. As a researcher focused on electromagnetics, he learned about origami antennas while exploring FIU for his next career move. “My goal is to do something that has impact, that helps humanity. This is why I’m doing research,” said Zekios. The antennas are a good opportunity to be involved in impactful research in the field of electromagnetics. TAC was the vision of Stavros Georgakopoulos, the center’s director and inventor of origami antennas. The discovery of the technology was unplanned. Georgakopoulos got to work. In 2013, he received his first round of funding through the National Science Foundation Emerging Frontiers in Research and Innovation (ERFI) grant, which was co-funded by the AFOSR. The research taking place at TAC will not only help the military but also spur a specialized workforce. 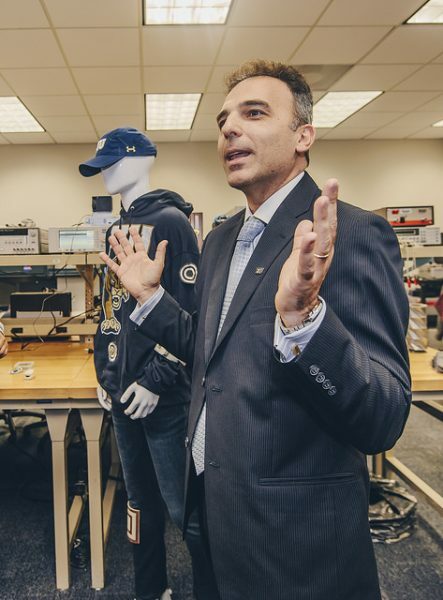 Dr. Georgakopoulos explains wearable clothing. “Creating a workforce that is knowledgeable in physically reconfigurable antenna design is important broadly for military applications, for communication, surveillance and all the ways we use the electromagnetic spectrum, including wearables,” said Philip Buskohl, a research scientist for the Air Force Research Lab (AFRL). (AFOSR is part of AFRL). In the future, soldiers could compactly store, collapse and deploy these origami antennas from their backpacks in the battlefield. 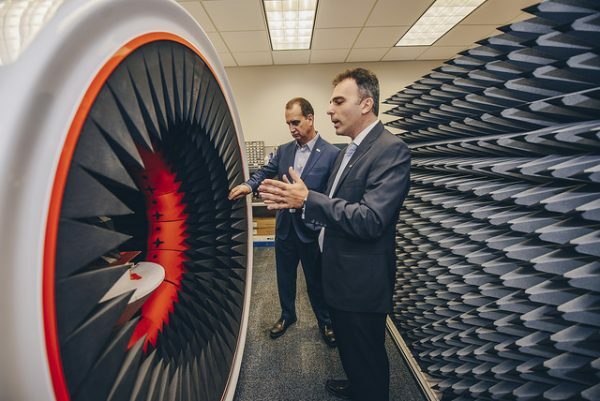 These antennas also have the potential to revolutionize space communications as they will fit into very small compartments and then be effortlessly deployed into large sizes once in orbit so that they can communicate with ground stations. The investment is promising for both Russo’s and Zekios’ futures. “This research has space applications, and I hope to one day work for NASA,” Russo said. For Zekios, this new approach to physically reconfigurable antennas is an application that combines his passion for physics and electromagnetics. “This is as close as an engineer can be to bridge the gap [between the two disciplines. ]” A lifelong learner, he hopes to one day pass on his knowledge as a university professor. While the origami antennas are in the research and concept phase, the goal is that some of these electromagnetic concepts will be deployed in the near future. Click here for more photos of the ribbon cutting ceremony. What an interesting endeavor! Best wishes. Perhaps someday soon, we will be able to deploy these origami antennas not just for space, but here on earth also to benefit the human experience, not just for the military but everyday life.